We stock a full range of feature rich Wall Mount Data Cabinets and are sure to have the solution for you at the right price. Whether you need a small 6u wall mounted rack or a 21u 600mm Wall Cabinet, you'll find it here complete with a full range of accessories. The compact design of the 19" Wall Mount Data Cabinets make them ideal for smaller networks and workgroups. The wall mount cabinets are available in various sizes and are supplied fully assembled. Each cabinet comprises a welded steel frame and adjustable front and rear 19" mounting profiles. 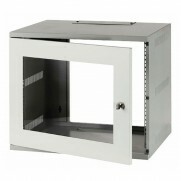 Cable access positions with removable plates are situated in the top and bottom of the cabinet. The cabinets feature a ventilation slots in the top, have a lockable glass front door, and removable sides. The wall mount data cabinet is finished in a high quality attractive black. A full range of wall mount data cabinet accessories can be found by clicking here.